Hello again! I have a card to share today! I made this card for the DT call going on at Mo's Dream Team. I am leaving it to the last minute as I have been super busy with my boys' baseball practices and games! It was everyday last week-can't wait for the season to end! I just love this image! She is adorable and always fun to color! I used MME paper and the tags are freebie printables from Prima's Friday Freebies on Facebook from several weeks ago. I love to check in an see what they have. Not too long back they had Nature Garden notecards and I was so excited as that collection seems to be my go to paper pad! The flowers are Wild Orchid Crafts, the stamp is from Whimsy and I colored my girl with Copics. I hope you all like her as much as I do. This is gorgeous Danielle. She is adorable and beautifully coloured. I love the design and scrummy papers. Wow - this is really beautiful!! I love your coloring, and you have some nice details here. Fab work Danielle! Love your take on Chelsea Sketch and the way you coloured this cute Mo's image, great project! A stunning card! Gorgeous colouring, design and details. Glad you joined us at Gingerloft this time. Definitely true you are "sew crafty" I love love the coloring absolutely amazing. Thanks for joining us at Great Impressions stamps!! Come join us again! This is so cute I just love your image all the colors you used. Beautiful project! Great composition and execution! Thanks for stopping by our house at 613 Avenue Create! Oh this is completely awesome! Love everything about it! Thanks for joining us at My Sheri Crafts! Gorgeous card! 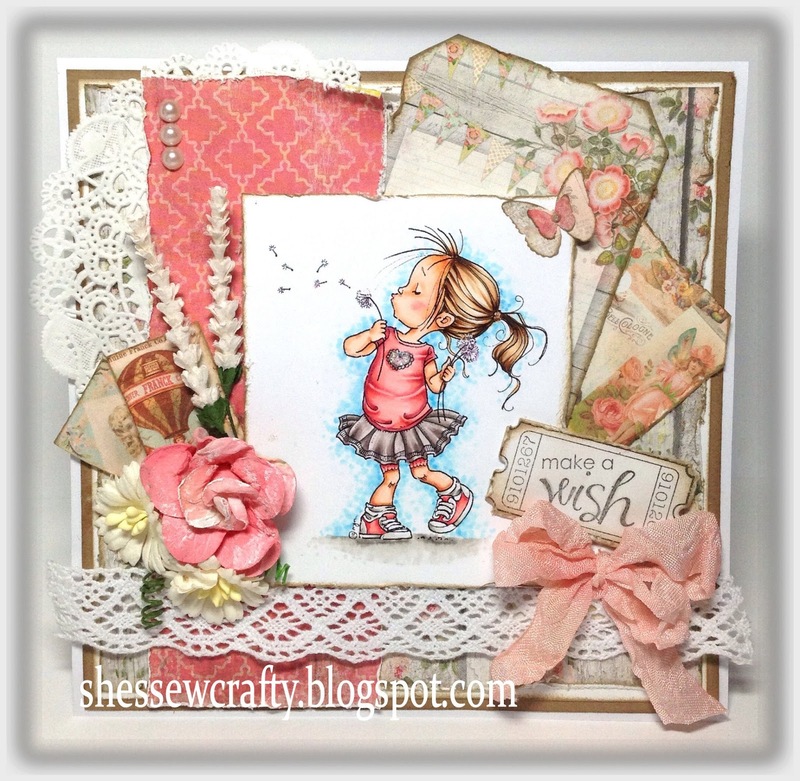 Love the image, the layout and your embellishments! Thank you for joining our Corrosive Challenge this fortnight. What a gorgeous card! Love that sweet image and your fabulous coloring! Thanks for joining the challenge at Wags 'n Whiskers! What a cute little girl :) Riminds me of my small son who is loving blowing dandilion clocks every time we go out walking :) Colours are super sweet also. I just love this image and you have chosen the presentation. The embellishments are perfect with a great balance of texture and dimension! Thanks for playing along with us at Crafter's Cafe Challenge Blog. This is super!! Love it!! Thanks for playing with us this month at TCCCB! I was having a look at your blog and LOVE your work! I was unable to email you sorry so am posting as a comment. You can delete my comment so it's not posted on your blog if you like. I own a digital stamp company and would like to offer you a design team spot.... either a guest spot or full time gig. Please check out my website: http://www.kithandkinstampco.com to see our current range of stamps. We're adding to the range all the time. We're a brand new australian company. If you check out the "about" page it will give you some information on my husband and I and the terms we are offering to our design team members. I hope you like the stamps and will consider becoming a part of our team.